I’ve joked that Little Engine Ventures is secretly a book club under the veneer of a business partnership. I’ve always been a reader but only since being around Daryl this much the last two years have I read with such focus and intent. In our monthly newsletter, we highlight one of the books that Daryl and I have each read. We have a continually updated blog post that documents our library. If you meet at our office, there’s a good chance you leave with a book in your hand. So in planning the 2018 Annual Partner Meeting this year a new idea we had was to have a book table. 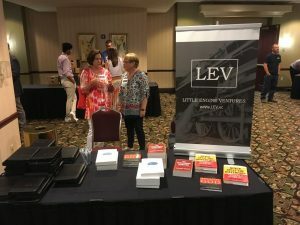 We picked five of the books we have found influential in starting LEV and its first two years of operations. These are the books that we find ourselves referring to in conversations. They are books that have given us language like “optimal stopping” and “margin of safety”. We ordered a bunch of copies of each, put a short note inside, and encouraged attendees to take one (or five) home with them if it would help their endeavors. Here are the five books selected for the 2018 book table and the note from the bookplate we added inside the front cover. The Intelligent Investor: Some say Ben Graham wrote the old testament of investing and Warren Buffett wrote the new testament. The commentary enclosed in this version guides the newly initiated. While skimming particular chapters on Mr. Market and Margin of Safety is foundational, a deeper study will reveal the congruency of their logic. Business for the Glory of God: Business is not evil, but it does present many temptations. Instead of conceding, we can strive to glorify God. While this book is less than a half inch deep, it reflects a deeper pool of wisdom worth frequent study. Algorithms to Live By: Writing software is a forcing function for one’s logic. The authors do a great job of applying methods to life. While this is not an investment book the approach is applicable. Never Split the Difference: Splitting a hostage is wrong. FBI hostage negotiator Chris Voss says it’s impossible to detach emotions from thinking. He then attempts to trump emotions by framing up a logical course to guide emotions… of others (and if inverted… yourself). While the logical parts of our brains reign like a man sitting atop an elephant, the damn emotional elephant walks wherever it pleases. The Outsiders: Individuals cannot expect above average performance and remain within the crowd. When several CEOs diverge with the same principles, at different times, and find astonishing success there must be valuable lessons worth inspection. While citizenship in Singletonville takes no less than 20 years, reading and re-reading this book can be done annually. What books would you suggest to us that could end up on the 2019 Annual Meeting book table? This entry was posted in Investors. Bookmark the permalink.